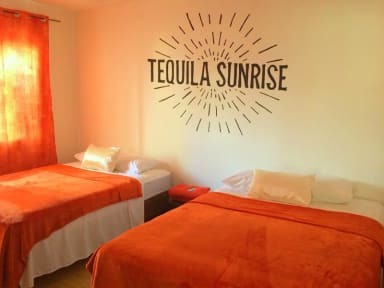 The mission of Tequila Sunrise hostel is to give the best stay of Guatemala city to each of our guests. For that reason, we choose our location in zone four, the most trending zone in the City. In addition, we prepare every morning a delicious buffet of pancakes, coffee, tea and season fruits. We have plenty of parking space. 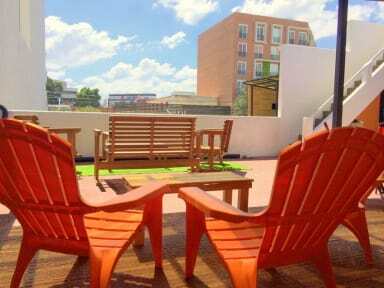 The property is located in the heart of zone 4, just a few blocks from '4 Grados Norte' (a walking street full of restaurants and bars). And a few minutes from the airport. We have a full equipped kitchen where you can cook. We created a nice terrace where you can relax, read a good book and have a comfortable rest. Tequila Sunrise BnB has seven private rooms and one shared dorm. Our facilities included, designated smoking area, laundry machines, free Wi-Fi in every room, security and reception 24 hours, a common computer, security camera circuit, refrigerator with sodas and beers, city maps, hot water. The kitchen is open so you can use it and cook your favorite meal.